‘These are anti-monumental times…The nineteenth century felt it right to express the significance of civic buildings by their imposing qualities. There was an identifying hierarchy to life … Gehry, however, makes rigorous anti-monuments.’ (Piers Gough, Modern Painters, Winter 1996, p55). Most would agree with Gough that the Bilbao Guggenheim is ‘large, spectacular, inspiring, dramatic and beautiful’. Gough also describes it as ‘the informal monument’. But this building is a monument. The façade, though beautiful, forms a formidable barrier. Access to the collection is through relatively small doors. When these doors are closed, after the public have marvelled at the scale of Guggenheim power, all the visitor is left with is ‘spectacular monumentality’. Bilbao has acquired an extraordinary building both in substance and effect. It was financed by the Basque government for £70 million as part of a regeneration programme (that also included a metro system by Norman Foster, a coach station by James Stirling and business parks by Cesar Pelli). Within six months the gallery returned this investment. However, the details of its construction (tons of titanium woven to replicate the sinuous form of Gehry’s origami experiments by means of the latest aircraft computer technology) and its financial success mask the fact that it is a building of the nineteenth century, not the twenty-first. If the purpose of a contemporary building is to reflect and enable the contemporary condition it is a ‘monumental’ failure. In terms of its conception and its programming Gehry’s Guggenheim is a nineteenth-century building, a cultural palace. The same is true of Frank Lloyd Wright’s Guggenheim in New York (1956), which was built at a time of great cultural and economic confidence in America. The windowless spiral refers to the energy and power of the curators and the collection – not the dynamic of cultural exchange with the public. It is about energy, power and containment harnessed by the Guggenheim brand. In 1998 Thomas Kerns, the director of the Guggenheim, stated his intention to make the Guggenheim a global ‘brand’ for fine art. This strategy requires memorable icons to engage the public imagination and the Bilbao building is such an emblem. It’s saying ‘Come and get your art here (but we own it and let you see it from time to time)’. Its architecture is so different to its context that it can be pinpointed in any photograph of the city. This strategy has worked before – over 70 per cent of visitors to the NY Guggenheim come to see the building rather than the art. The displays are dwarfed by the physique of the architecture. There is an argument that the Guggenheim Museum Bilbao is not purely a public realm project. For the public to have such a magnificent building and art collection is laudable, but just as an embassy is legally the territory of the country of origin, so the Guggenheim is the territory not of the Basques but of the brand. It is imposing a cultural viewpoint and excluding potential engagement with its public and the contemporary world. ‘In seventeenth-century England, the didactic theatre of authority was swept aside by the Reformation and was replaced by white abstracted space that encouraged individual responsibility and reflection.’ (Andrew Graham Dixon, History of British Art, BBC publications, 1996, p30-42). Yet here we are at the beginning of a new century faced with a theatre of authority once more. Although I’m stimulated at the impact that the Guggenheim has on Bilbao I am less convinced about its status as contemporary architecture. First published in Eye no. 34 vol. 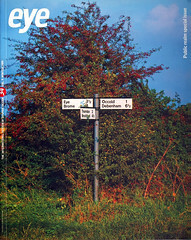 9, Winter 1999, Public realm special issue.